Deep Carpet & Rug Cleaning Services Unsworth BL9 | Quality Property Care Ltd. Using a professional carpet and rug cleaning company, and using its services regularly is a very good plan, especially if you or somebody in your family suffers from dust or pollen allergies or has respiratory problems. The quantities of dust mites, dirt, dust and germs in our carpets are actually quite alarming, so don’t hesitate to hire Quality Property Care Ltd., which provides a high quality rug and carpet cleaning service in Unsworth BL9 and the area. The carpet and rug cleaning company can also deliver: blinds cleaning, curtain cleaning, drapery cleaning, as well as bed bug mattress treatment and mattress cleaning , which will help eliminate the allergens, dust mites and kill off all bacterias. 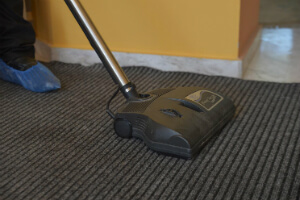 The firm offers commercial and residential rug and carpet cleaning at a competitive rate. To get a totally free price offer in less than 2 hours, just call the expert customer care support or use the online form. The first thing you need to do to reduce the stain reach and the potential damage, is to blot out the stain with a piece of paper or a cloth. From edges in blot out the spot and check the paper or cloth or paper to see if it’s transferring. This will remove most of the stain and leave just a small amount for us to remove which make our job easier and your carpet’s chances a lot higher. Once we get there we examine the carpet and figure out which cleaning agent will do the job. The carpet is cleaned with a hoover to take away any debris and prepare the fabric for cleaning. Once hoovered we apply the cleaning agent on the spot and let it sit for a while so it can respond with the stain and help lift it up from the fibres. To remove it all we use a small nozzle and our highly effective hot water extractor which blasts the spot with a hot steam jet while simultaneously drawing all of the gunk and filth, as well as water, out with a strong vacuum. Nothing of the stain and detergent is left, with only about 5% of the moisture used to thoroughly clean left to evaporate the natural way. 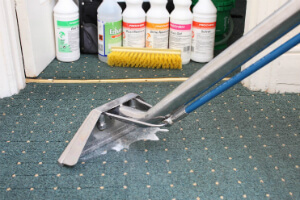 Based on the day and thickness of your carpet, the process should take anywhere around 3-4 hours. For more delicate materials like silk and cotton we use a more gentle approach which does not depend on heat or moisture to remove a stain. Natural materials hardly ever react well to both moisture and heat so we are using a special dry compound which comes in a granulated form. The same method of stain and rug or carpet prepping does apply as was explained in the hot water extraction technique, allowing us to better remove the blemish. This time we pre-treat the spot with a special detergent, specially chosen for the type of fiber we are cleaning. It’s applied and let to set into the spot. Once that is done we apply the granulated detergent and spread it with a fine brush. This imbeds it into the fibers of the material forcing it into the stain. The dry compound is also let to set for 10 mins after which we extract it using a high powered vacuum machine, removing 100% of the filth and detergent. There is no trace left behind, leaving both your carpet and natural rugs fully cleaned and spotless. Regarding rugs we clean Wool rugs, Persian rugs, Chinese rugs, Tibetan rugs, area rugs, handmade rugs, shaggy rugs, silk mix rugs, Indian rugs, Turkish rugs, Egyptian rugs, play rugs, antique rugs, floor mats, entrance mats, logo mats, industrial mats, rubber mats and anti fatigue mats. Not like standard synthetic carpets, rugs can be a tough task, when it comes to proper and comprehensive cleaning. Our carpet cleaning specialists, though, are well-trained to deal with all types of rugs and carpets: cotton, wool, synthetic, silk, sude, viscose, linen, plush, chenille, nubuck, leather and acrylic. Depending on the fabric kind, the professional carpet cleaners in Unsworth BL9 chose the most suitable procedure. Attention: we always examine the detergents on the back of the rug to ensure it will not get wasted. Bear in mind that Quality Property Care Ltd. carpet cleaning company, though, works only with examined and 100% biodegradable cleaning detergents with no chemical substances. Last, but not least, the carpet cleaning groups can also deliver: Bed Bug Mattress Treatment Mattress Cleaning Curtain Cleaning, Drapery Cleaning, Blinds Cleaning. Be aware that if you purchase more than one service, we will make a special discount for you! Get your deal now and don`t get worried about the cleanliness at home the next day! We would be happy to help you! If you are in Unsworth BL9 or the area and you require professional commercial or residential carpet and rug cleaning, bed bug mattress treatment, mattress cleaning,, curtain cleaning, blinds cleaning, drapery cleaning, or a combination of Two or more of these services, all you have to do is call the customer care service at this number 020 3746 4287 or complete and send the online booking form, and you will have written confirmation via e-mail and sms as soon as possible! Same day reservation is possible, as well as booking on bank holidays and weekends without any price increase. Book your professional rug and carpet cleaning service right now!